Last updated on February 5, 2019 . All persons are named from left to right in the photos. New recruits and officers pose for a group photo after a Sheriff's Office swearing-in ceremony Friday. At the far left is Warden Donald Lombardo. In the middle in white is Sheriff Bob Nolan and to the far right is Undersheriff Frank Sippel. Promotions, new hires, retirements of two K-9s and the additions of two others were all part of a swearing-in ceremony at the Cape May County Criminal Court House on Friday afternoon. Earning a promotion, a sergeant became the first female lieutenant in the Law Enforcement Division of the Sheriff’s Office. In addition, a 58-year-old former officer with the Wildwood Police Department was sworn in as an investigator after going through the police academy a second time in his life, making this ceremony anything but typical. Not to mention retiring K-9 Hank, a bloodhound, serenading the crowd in the courtroom gallery with his howls at the sound of applause. Nolan conducted the swearing-in ceremonies. Officers were sworn in as follows: Sheriff’s Officers Chris Bieberbach, Robert Kelly and Patrick Quinn; Corrections Officers Darlene Asencio-Perez, Christine Erpen, Brian Harrison and Joseph Fowler; Sheriff’s Officer Lieutenant Beth Perednas, Investigator Mike Siderio and Sheriff’s Officer Sergeant William Gouse. Perednas’ daughter, Lorin, and husband, Tony, attended the ceremony. The new lieutenant, the first woman to attain that rank in her division, grew up in Sea Isle City. She and her family live in Dennis Township. Prior to the ceremony, she said that she is looking forward to her new role in the Sheriff’s Office. Perednas’ K-9 partners, Hank, 8, a bloodhound, performed tracking, and Jax, 9, a Belgian Malinois was trained in narcotics. They officially retired Friday and will continue to live with the lieutenant, but as pets, after excelling at their long careers in law enforcement, Nolan said. For Siderio, a married father of four with four grandchildren, the thought of going back into police work seemed like an unattainable dream. He left the Wildwood Police Department after nearly 12 years of service to help take care of his son, who was suffering from a breathing illness. Siderio and his wife, Cindi, opened a tattoo parlor and settled into life as business owners. Decades later, after some conversations with Nolan, a longtime friend, he decided to try to get back into law enforcement. “All my life I have always been physically active. If you don’t use it, you lose it,” Siderio said. But going through the five-month rigors of five days a week at the police academy in Cape May seemed a bit daunting, he admitted. Especially since recruits were about half his age. “I definitely held my own. The younger guys got in better shape as time went on. But I stayed the same. I held my own,” Siderio said with a laugh. His wife was alongside him for the ceremony. Nolan said it was remarkable that Siderio would not only return to law enforcement but go through the academy successfully at this point in his life. Then Nolan said with a laugh that he didn’t think he could go through the academy again. At the end of the ceremony, two new officers joined the room. They were two K-9s, keeping the number of police dogs to six in the Sheriff’s Office. Nolan said that way three are on in the day and three at night. K-9 Ares, a Belgian Malinois, will be patrol and narcotics detection trained. His handler is Officer Connor Hughes. The other new K-9 addition, Frankie, a German shepherd named in honor of Trooper Frankie Williams, who was killed in the line of duty in 2006, will be patrol and explosives detection trained. His handler is Officer Dustin Phillips, who was good friends with Williams. The K-9s and their handlers will be attending 16 weeks of training conducted with the New Jersey Police K-9 Association in Voorhees. All the inmates were safely transferred to the new Cape May County Jail on Monday Jan. 14. Cape May County Sheriff Robert Nolan credited the Correctional staff with assistance from the County Prosecutor’s Office and all local police departments that participated in the orderly transfer. The new jail is located next to the old jail, which will be demolished in the future. The need for a new jail arose as the old building was not fitting within state code and was becoming too costly to maintain. The Cape May County Freeholders made the decision to build a new jail based on the options that were available. Closing the old jail and sending local prisoners to other counties would have cost more than $12 million per year, which would have exceeded the cost to build a new jail in roughly three years. The issues with rehabilitating the old jail were too prohibitive to become a viable option. Published in the OCNJ Daily by Tim Kelly on January 7, 2019. Caregivers and loved ones of the elderly and autistic individuals have enough to worry about. Thanks to a free program available through the Cape May County Sheriff’s Office, the fear of the person wandering off and becoming lost doesn’t need to be one of them. Project Lifesaver employs a system that uses a small radio transmitter worn on the client’s wrist or ankle and a receiver operated by the Sheriff’s Officers to quickly locate clients suffering from Alzheimer’s Disease or dementia, or those with autism who may be at risk to wander off. 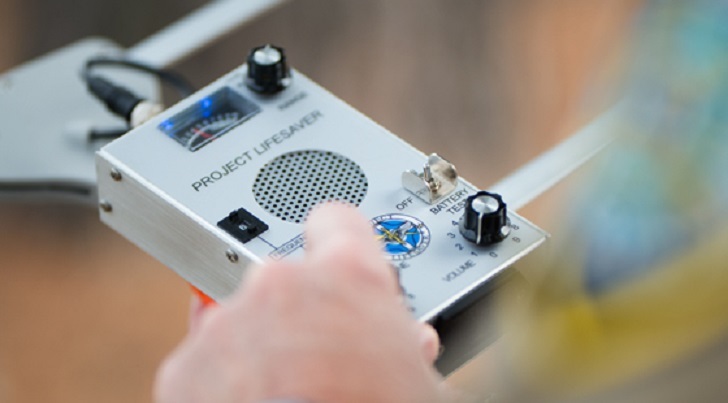 Project Lifeline has its own radio frequency, and each user’s transmitter has a unique frequency as well. This enables trained operators to determine which individual is assigned to each transmission and the location where it is being sent from. The majority of the Sheriff’s Officers are trained in the use of the technology and eventually all will be, Phillips added. Nationally, the program has resulted in the rescue or 3,513 people since it began in 1999, according to the Project Lifesaver International website. In the county, Phillips said the program currently serves 32 individuals. Four people were located in the county in 2018, the last figures available. Even more impressive, since the project was implemented locally in 2005, the transmitter and receiver have a 100 percent success rate. The transmitter has a range of about a mile, he said, meaning that the Sheriff’s Department officers have the ability to comb an area with a two-mile radius in approximately five minutes. The program is specifically designed for people whose challenges make it unlikely they would go unnoticed long enough for them to wander outside the transmitter range. People with milder challenges, who do not have round-the-clock caregivers may not be a good fit. “It is a great tool to help us find people and to provide some peace of mind to the caregivers,” he said. Additionally, clients using the system may do so when they travel outside the area. A caregiver simply informs the local authorities the person is in town, and their information will be fed into that area’s database and monitoring capabilities. The only drawback to the program, he said, is the fact that more people do not take advantage of it. Unlike many other location technologies such as GPS, the Project Lifesaver is not dependent on satellites or Wi-Fi connections, Phillips said. “It’s a simple transmission of radio waves, so it works in power outages. Sometimes the satellite will go out. Or you might be in a dead spot where the satellite won’t work. That will not affect this system,” he said. According to Phillips, the technology does not come cheap. A receiver costs more than $1,000 and each wearable transmitter has a $275 price tag. However, partnerships with groups such as Faces of Autism obtained grants and other sources of funds used to purchase the hardware and train personnel. The program is not simply a location technology. Project Lifesaver also provides police-community partnership training and education and awareness initiatives. “It is a great opportunity for us to help people on one of the worst days of their life,” said Phillips, a four-year Sheriff’s Department veteran and a resident of Cape May Courthouse. At present, there are openings for 12 more individuals to enroll in the program, he said. To apply for Project Lifesaver, visit www.projectlifesaver.org or call the Cape May County Sheriff’s Office at 609-463-6420. View our Project Lifesaver Page.